The World Of Ktdata » Blog Archive » Swords & Soldiers Heads to the 3DS! Are you ready to take control of troops and guide them to victory? Swords and Soldiers 3D is a side scrolling real time strategy eShop game for the Nintendo 3DS. This game has been widely popular on other systems such the Wii, iOS, PS3 and PC. Now it is time for Swords and Soldiers to make it’s way to the 3DS. What did I think about the game? Read more to find out! The game play of Swords and Soldiers 3D is a combination of a traditional side scrolling game and a real time strategy game. You can control which characters to create but once the characters are created they pretty much do their own thing (gather gold or run forward to attack the enemy). You can assist the troops by moving forward on the map and use special abilities to aid your troops as they fight forward. 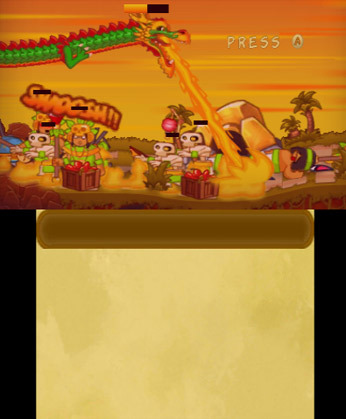 The goal of each level is to destroy a castle at the end of the map. Watch the trailer below to see some of the gameplay in action. I have not played Swords and Soldiers on other systems but I can definitely tell this game is a port, some of the controls don’t translate over too well. An example of this is how you target something when you want to use magic. 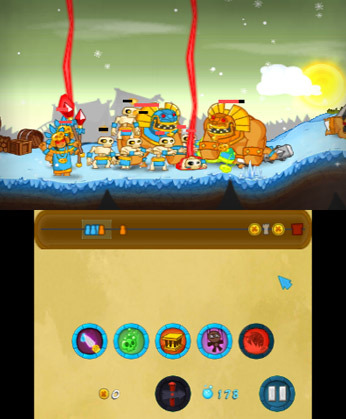 All the gameplay is on the top screen and the bottom touch screen of the 3DS is used to build troops and target spells. It’s a little awkward using the bottom screen to control a pointer on the top screen to target units. I could tell that the original targeting was meant to have a Wiimote or finger select on a unit directly. Overall it didn’t detract too much from the gameplay but it was definitely noticeable. Now onto the gameplay itself, it’s super addicting. I can see why this game did so well on the other platforms. I had to force myself to stop playing so I could write this review. Since you can’t control what a unit does after it is built timing is super important in this game. Building a unit at the wrong time could change the outcome of a battle. The game keeps you interested by gradually increasing the difficulty without overdoing it, I never once thought a level was too difficult at considering where I was in the game. I was so drawn into the game that I didn’t realize I had spent the last two hours playing the game. One minor negative about the game is that it takes you back to the level select after each mission and you have to hit start to being the next one. The cut scenes in this game were as enjoyable as the actual game. I loved seeing the motivations of all factions, especially the Vikings! Finding the right sauce is an important thing after all! Overall this is a fun game to play, if you are a fan of this game it’s a no brainer for the 3DS. 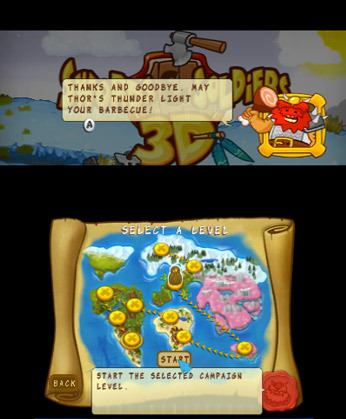 If you are looking for a quick and fun game to play Swords and Soldiers 3D for the 3DS is a pretty good choice. Although there are a few quirks with the game being a port, I had a blast playing it. Big thanks to H2OAcidic/Andrew from Marooners’ Rock for hooking me up with a review code. If you are interested in getting Swords and Soldiers 3D head on over to the Nintendo eShop today!